Joe Calzaghe is a former super-middleweight boxer who was unbeaten in his 46 fights. Most recently, he was a contestant on Strictly Come Dancing. Who is Joe Calzaghe, how old is he, when is his birthday, how tall is he, where is he from and what is his background? Joseph William Calzaghe, known as Joe Calzaghe, is a Welsh boxer who was born on March 23, 1972, and is 46 years old. He is 1.83 metres tall. Calzaghe was born in London to an Italian father and a Welsh mother and the family moved to Wales when Calzaghe was two. He started to box at the age of nine. After successfully competing as a schoolboy, Calzaghe went on to win three consecutive British ABA titles before turning professional in 1993. Why is Joe Calzaghe famous and what is his occupation? Joe ‘The Pride of Wales’ Calzaghe was an extremely successful super-middleweight boxer. He was unbeaten as a professional fighter. What is Joe Calzaghe’s net worth? Rantsport.com report that Calzaghe has a net worth of $21million. How much does Joe Calzaghe earn? In 2008, he reportedly earned $10million for his fight with Roy Jones Jr.
How much does Joe Calzaghe weigh? The champion fighter reportedly weighs in at 174 pounds or 79kg, but during his fight career as a super middleweight he had to weigh in between 160 lbs (73 kg) and 168 lbs (76 kg) for competition. Is Kristina Rihanoff still with Joe Calzaghe? He has split from Kristina Rihanoff, his glamorous partner from the 2009 series of Strictly Come Dancing. They were together for 4 years. What fight did Joe Calzaghe win with one hand? In September 2005, the boxer fought Kenyan Evans Ashira, Calzaghe broke his left hand in the third round but continued the contest, fighting one-handed for the rest of the bout. Calzaghe went on to win on points via unanimous decision. When did Joe Calzaghe start boxing, where is his gym, is he retired, when did he retire? He started boxing at the age of nine and turned professional in 1993. He was trained by his father in the family’s boxing gym, Newbridge Boxing Club. Calzaghe retired undefeated in 2009. When was the Joe Calzaghe vs David Bellew fight, what was the result, how much was the prize money? The Welsh boxer has not fought David Bellew. 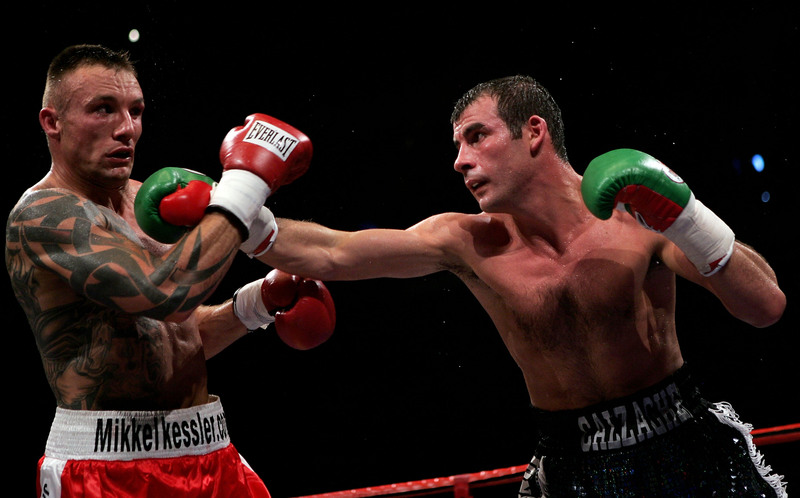 Calzaghe’s most memorable fight was against Jeff Lacy in 2006. Calzaghe went into the fight as an undervalued fighter and almost pulled out due to a wrist injury. Calzaghe won the fight easily and the BBC described Calzaghe’s performance as majestic. The purse for this fight was a reputed £5million. Does Joe Calzaghe have any children? Joe Calzaghe has two sons with ex-wife Mandy. They are Joe, born in 1994 and Connor, born in 1997.
Who has Joe Calzaghe fought in boxing matches, how many fights has he won, what are his most famous fights? Joe Calzaghe won all 46 of his professional fights, 14 were awarded on points and he won 32 with a knockout punch. He first won the WBO super-middleweight title after defeating Chris Eubank in September 1997 in a close fight that was decided on points. Calzaghe continued to defend his WBO super-middleweight title and in 2006 fought American Jeff Lacy and Calzaghe managed to land 1000 punches over the 12 rounds. This fight increased Calzaghe’s profile in the US. In 2007, in perhaps the most impressive boxing match of his career, Calzaghe fought Dane Mikkel Kessler. Calzaghe proved himself to be the superior boxer, using his speed and skill to overcome the power of Kessler. 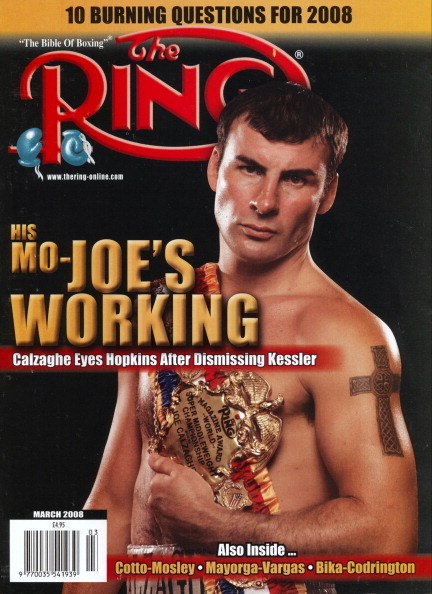 Calzaghe went on to beat Bernard Hopkins in April 2008. This was a split decision, as Calzaghe fought back after being knocked down in the second round. In November 2008 Calzaghe fought Roy Jones Jr. Calzaghe was put down in the first round but regained control of the fight to win on points. He announced his retirement in February 2009. Is Joe Calzaghe married, who has he dated in the past, was he married? Joe Calzaghe was married to Mandy Davies from 1994 until 2005. He then had a long-term relationship with Emma-Jo Larvin, which ended when he was fell for his dance partner in Strictly Come Dancing. He split with dancer Kristina Rihanoff in 2013. He is currently rumoured to be dating make-up artist Lucy Griffiths.